A couple years ago, I switched from canned beans to dried beans. Cheaper — plain a simple. Avoids BPA exposure from canned beans. Avoids excess sodium in canned beans. Less packaging waste. I buy most of my beans from the bulk bins, reusing plastic bags. Even if you buy prepackaged dry beans, it involves much less packaging per amount of beans. Dry beans require less energy to transport because they lack the liquid weight. While I was happy enough with my bean-cooking method (quick soak or an overnight soak, drain and rinse, boil for about an hour), we recently discovered a new method that yields delicious, lightly salted cooked beans, reminiscent of the canned variety in a good way. We happened across the idea of brining beans while flipping through an old edition of America’s Test Kitchen. Basically, it’s a modified version of the quick soak, with salt added to the cooking water. I initially reacted with skepticism, since the number one rule of cooking dried beans is “don’t add salt until the beans are fully cooked — it will make the beans tough and increase the cooking time.” However, something about this method totally works. Put desired quantity of dried beans in a pan. 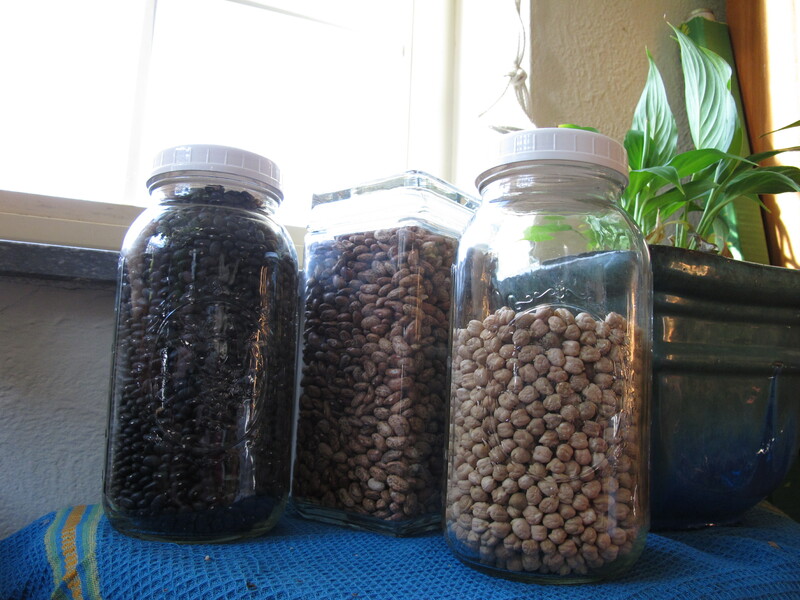 Add water to cover the beans, plus 1/2 to 1 inch on top — keep track of how much water you add. For every quart of water, add 2 generous teaspoons of salt. Boil 3-5 minutes, then remove from heat. Let stand at least one hour (I’ve let mine stand for up to 8 hours — time over one hour neither helps nor hurts). Return to pot and cover with fresh water. Bring to a boil and cook 40 minutes to an hour, or until beans reach desired tenderness. Alternate cooking method: place in crock pot with enough water to cover. Turn to low, and cook for 8-10 hours. I’ve used this method successfully with black beans, pinto beans, and garbanzo beans thus far. It should work for almost any kind of dried bean. For ultimate convenience, follow the brining steps in the evening, letting the beans soak overnight, rinse them in the morning, and place in a crock pot to cook while you’re gone during the day. You’ll return home to fabulous beans just waiting to be incorporated in your dinner — almost as convenient as the canned variety! This entry was posted in Food, Green Ideas, Recipes and tagged cooking beans, dried beans, vegetarian cooking. Bookmark the permalink. I do dried beans too. So much cheaper. I just throw mine in the crockpot. Hmmmm… very interesting. A friend of mine does something similar only she uses baking soda instead of salt. I think it’s supposed to make them less gas-inducing. Have you noticed any difference with the gas thing using this method? Someday I’ll have to get organized enough to soak my beans. I generally just toss them into the crock pot overnight. In general, I accept some gas as part of relatively normal digestive functioning while eating a healthy, high fiber diet that includes veggies, whole grains, and beans. Woo Hoo! I gave it a try and it worked like a charm – at least it worked in the sense that the beans taste great and are nice and soft. It remains to be seen how they will score on the fart-o-meter!